Axum is Ethiopia's most ancient city and home of queen Sheba. At the height of its power, between the 4th and 7th centuries AD, the Axumite empire controlled most of the present day Ethiopia. The city of Axum was a vital commercial croosroads between Egypt and the Mediterranean and the eastern countries of India and Ceylon. Exports from Axum (ivory, animal skins, and rhino horn) and improts from India, Arabia and Egypt (wine, olive oil, iron, and glass ware) were constant exchanges. It's riches can still be seen in the obelisks (stelae) and churches that are built in the city thousands of years ago.The age of the obelisks and their use is a complete mystery. However, they are expected to have been erected around the beginning of the 4th Century AD. Some speculate them to be memorials to deceased kings and queens due to their proximity to nearby tombs. The tallest of the monoliths, now fallen and broken into six massive pieces, was 33.3 meters tall and weighed about 5 tons. 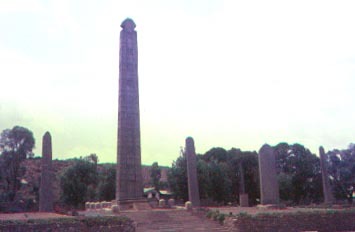 The tallest obelisk still standing at Axum today is 23 meters. Crowns and Chlothings of ancient emperors are exhibited in the churches showing the long history of the city. Axum is also one of the places where the Arc of Convenent is said to be. Towards the end of the 7th century, the Axumite Empire was weakened by constant war and was eventually replaced by the Zagwe dynasty which moved the capital farther south.